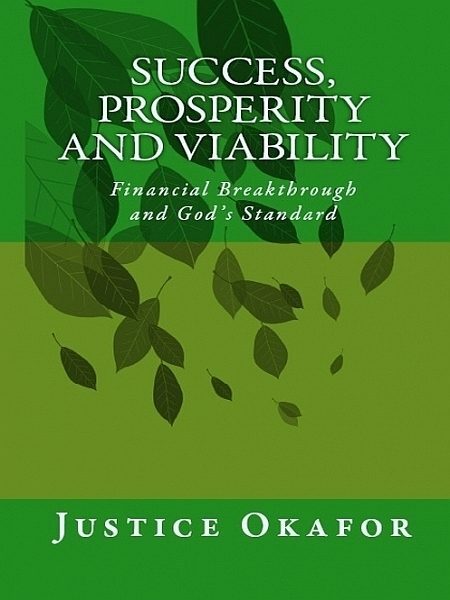 A book writing by Justice Okafor entitled “Success, Prosperity And Viability; Financial Breakthrough and God's Standard The Author says that the key to a successful business is effective service, while revealing a clear guide to an effective service. He said; every dream can be realized no matter how big. He disclosed how to overcome the challenges of startups in every business, career, dreams and goals in terms of resources, employment and aids. He defined the subject of success and viability and provided useful tips to becoming successful while pursuing dreams and visions with reference from the bible. The Authors heartbeat is to see young people emerge great, to revive individuals and businesses that are bankrupt, to revive and to bring to fulfillment the dreams and vision of everyone that will read the book and most of all to eradicate the virus called failure while introducing them to a viable and productive life. Success, Prosperity And Viability; Financial Breakthrough and God's Standard is a must read for everyone. The Author Believes that the Foundation of every dream and vision (Business, ministry, Careers and goals) is very important and laying a strong foundation require knowledge and skills, so he tries to communicate great wisdom and insight in his book which will aid individual skills and increase knowledge to ensure a solid foundation for the visionary. So now, it is possible to bypass the challenge of finance, marginalization and delays while raising a lasting, successful and productive structure.